CANADA: Wind turbines are reducing the energy costs at a diamond mine in Canada on the edge of the Arctic circle. Ben Miller reports on the construction and operation of the world's most northerly large-scale wind project and how the turbines will pay for themselves within eight years. Gord Stephenson flies to work. He takes a plane from Yellowknife, the capital of Northwest Territories, Canada, to his workplace, the Diavik diamond mine, 300 kilometres away on the subarctic Lac de Gras. The mine, only 210 kilometres south of the Arctic Circle, is not connected to the electricity grid. It generates its own power from a combination of diesel-fuelled generators and the world's most northerly megawatt-scale wind farm. After a feasibility study that confirmed a strong wind resource, Diavik, a subsidiary of mining giant Rio Tinto, installed four Enercon 2.3MW E70 turbines at a cost of $33 million. The 9.2MW wind farm began delivering power at the end of September 2012. Stephenson, a civil engineer, oversees the building of capital projects at the diamond mine. He has been involved with the wind project since joining the company in January 2012, taking responsibility for contractor management, commissioning, testing and permitting of the wind farm. "Our primary source of energy is diesel fuel, which is trucked in during the winter on the ice road," he says. "Annually, we require approximately 70 million litres, most of which is for power generation. The wind turbine installation was designed to reduce this reliance by over four million litres a year." Stephenson handled the logistics of transporting the turbines to the mine, a process that required customising trailers to move 60 loads of components. The turbines were moved between February and April when the 350-kilometre road over the lake, the only means of overland access, had frozen sufficiently to be safe to drive on. 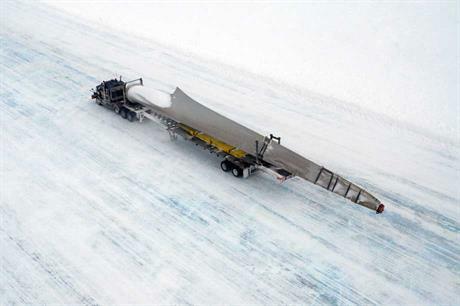 The 33-metre blades, the longest loads ever transported on the ice road, were shipped from Enercon's German factory to Thunder Bay, Ontario, then for 3,500 kilometres by road to the mine. Constructing the foundations was an arduous process because of the granite bedrock very close to the surface of the ground. Blasting was required for excavation before a level pit was made and a 2.7-metre thick concrete foundation was created for each turbine. There was concern the bases might tilt as the ground froze and thawed through the seasons. "Given we are in a region with permafrost, a foundation monitoring programme was implemented to check for any frost-induced effects," says Stephenson. "So far we have not experienced any differential settlement or ill-effects." Diavik contracted Mammoet Canada to supply the 300-tonne crawler crane for the turbine installation. "At the time of construction and for the term we required, which was a one-year rental given our ice road constraints, the only crane it was able to source came from Alabama in the US," says Stephenson. Enercon assembled the towers, nacelles and blades, installing one turbine a week over four weeks in July and August. Diavik shortlisted four manufacturers for the projects before choosing Enercon turbines. "It was the right fit. The E-70s have many features suited to our climate - blade heaters, direct drive, cold climate steel for the towers," says Stephenson. "The primary concern over a geared turbine was that at sub-zero temperatures, even the best oil will stiffen up, causing increased loads on the transmission. "We also perceived the transmission as higher risk and an expensive maintenance item if it were to fail. The other concern we evaluated was the potential for a fire hazard with the large volume of oil in the nacelle. The only lubricant we had to change is a very small amount of oil for the pitch and yaw motors, which we changed to an arctic-rated substitute." "We went through a right-sizing exercise with Genivar to optimise the system for economic payback given a remaining mine life of about ten years." The four turbines represented the magic point that maximised return, says Stephenson. "This is not the first Enercon project in extreme cold conditions," says Marc-Antoine Renaud, Enercon Canada's business and development manager. "We have turbines in Antarctica, at Australia's Mawson research centre, but they are small 300kW units. One challenge with this project is the multi-megawatt aspect of the turbines. But the biggest challenge was transporting the components when there was only access in winter." According to Renaud, a great deal of engineering work went into ensuring a smooth transition of the mine's power flow from diesel to wind power. "The key was to design the power management system that controls the diesel output to balance the electricity produced by the wind turbines," he says. Diavik's diesel generators - nine 4.4MW, two 3.3MW and smaller standby units - are sited in the mine's two powerhouses. The powerhouse operators choose the correct combination of generators and wind to match the system load, maintain sufficient reserve power and ensure the mine's power never goes down. The operators are also responsible for maximising the power from the wind turbines, which, says Stephenson, has increased their workload, but they are handling it well. "The wind farm was designed around a low-penetration ratio," he says. "This is the percentage of wind power supplied over total system load. So, if the site required 20MWh of power and wind was producing 3.5MWh, we would have 17.5% penetration. The penetration ratio for wind we were looking for was 10%. "But experienced powerhouse operators have exceeded expectations, pushing this ratio to the 50% range when the turbines are generating full power. The ability to capture these peaks has substantially increased the overall wind power output." Demand peaks during staff shift changes and varies over the course of the year, ranging from 19MWh in the summer to 26MWh in the winter when large heating fans are used. The turbines stopped working in December and January when the temperature fell to -30 degs Celsius. Unexplained error codes were showing up, causing the system to shut down. "The E-70s are rated to -40 degs Celsius, but the continuous exposure to sub -30 degs temperatures caused some significant downtime this past winter," says Stephenson. "We worked with Enercon to swap some lubricants and we have installed heaters in the tower and nacelle to permit maintenance in the cold weather. This upcoming winter will be the true test of the cold weather performance." Renaud puts the problems down to teething issues. "As they were experiencing their first winter, the turbines at Diavik required some tune-up and also upgrades on consumables and minor components to better withstand the extreme cold," he says. "We aimed to have 17GWh of power output a year. After being down for two months it's now at 14GWh, but we expect it to reach 15GWh," says Stephenson. "Enercon supplied the interface between our control system and the turbines, which are managed and operated by Diavik. We have a limited service agreement with Enercon. They carry out maintenance four times a year per turbine. We do initial troubleshooting, they come up and do any big work." In the first year of operations, the turbines provided, on average, 7% of the power generated at the mine and saved Diavik 3.5 million litres of fuel. The turbines will pay for themselves in eight years, estimates Stephenson. "A secondary benefit of the turbine installation is the voltage support and power factor correction the turbines are able to provide," he says. "They can't be directly measured as an offset for litres of diesel, but there's an increase in efficiency for the overall power system with reduced line losses and increased generator efficiency. "It's also a great environmental initiative and it gives positive recognition for the mine. I've noticed how quiet the turbines are. You can stand under them and there's no mechanical noise. Wind turbines were the right choice for Diavik and should the resource prove itself we'd have no hesitation in recommending wind energy to other companies."